Flickr, a popular photography website, just launched their “People in Photos” feature today. And I love how it works. You simply type in a person’s name and it’ll add them into the photo. If you click on the little icon next to their name, you can create a square around their faces to identify them. Here is a sample where I used the “People in Photos” feature. In the photo below, you can see Louis Gray, me, and Jesse Stay. Once the square is created, drag the square over the person’s face. Continue doing this for the next person, and the next. You can read more about Flickr’s “People in Photos” here. I haven’t had the chance to write a decent post about my experience at New Media Expo yet. But it was definitely amazing. I met a lot of wonderful, incredible, and quite inspiring people. And I also got some great photos of my one day at the event. Here are a few that I’d like to share. 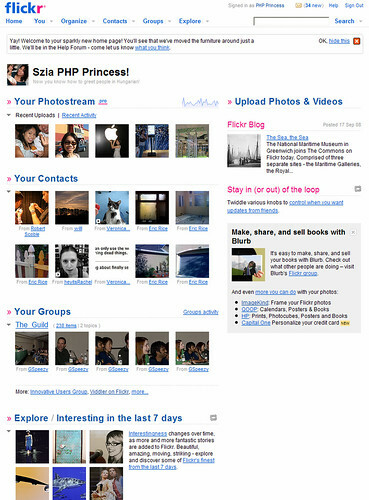 I finally purchased a Flickr Pro account too, so I’ve been busy customizing that as well! New Media Expo was like Hollywood, for geeks! And I mean that as the best compliment possible! I’m happy that I got the chance to meet Felicia Day, iJustine, Mostly Lisa, Veronica Belmont, Robert Scoble, Sarah Austin, Colin Devroe, Rob Sandie, Brandice, Rachel, Michelle Galvan, DJSteen, Geoff Smith, Chris Marquardt, Christine Lu, Chris Luckhardt, Greg Walker, Tony Wang, and so many more! It looks like Flickr now has Video as of today! But read the rules before you start uploading content. Videos are to be under 90 seconds that you have created yourself. They’re going for the “long photo” feel.